Be sure to watch my demonstration video below too! You will need to have a piece of board cut, however you would like it to measure and scale it to the bed that you will be using it with. You can easily go to your local hardware store, give them your measurements and they can cut it to your specification right there on the spot. Or you can do what I did and use reclaimed wood by piecing it together. 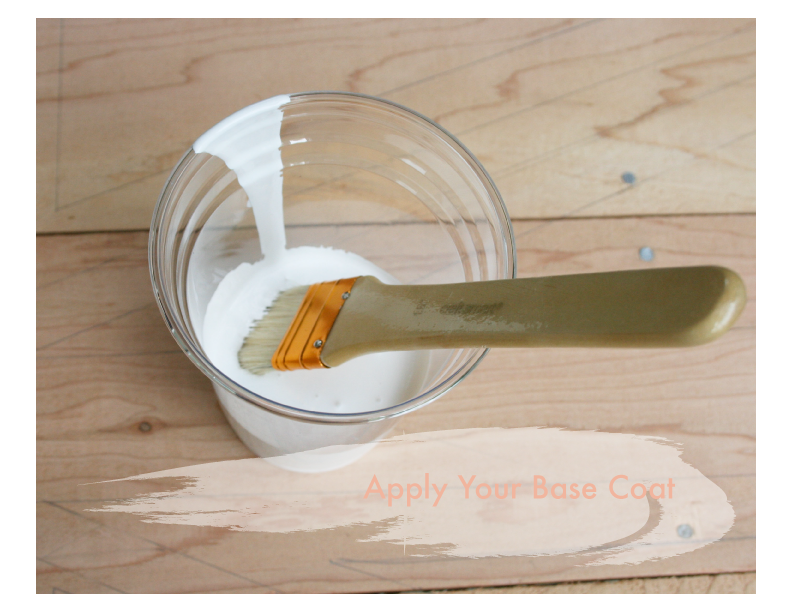 Apply your base coat. I used a primer I had around the house which also doubled as my white background for the parts that the tape will cover up for the union jack motif. Make sure this is good and dry before you apply your tape so that none of the paint comes up when you pull the tape up. 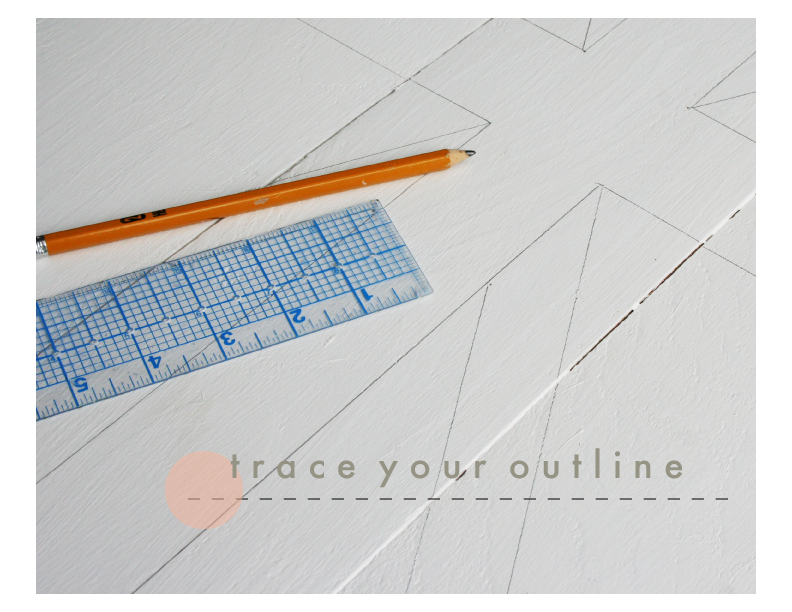 Then you will trace your motif using a ruler, think yard stick depending on how big you are going with this. 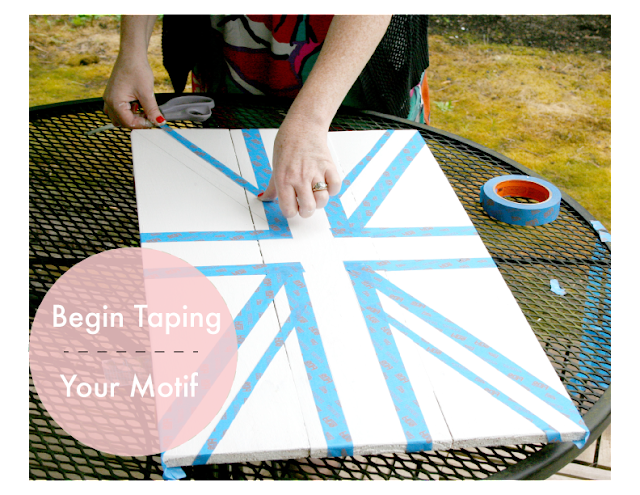 You can find how to draw a union jack motif here. 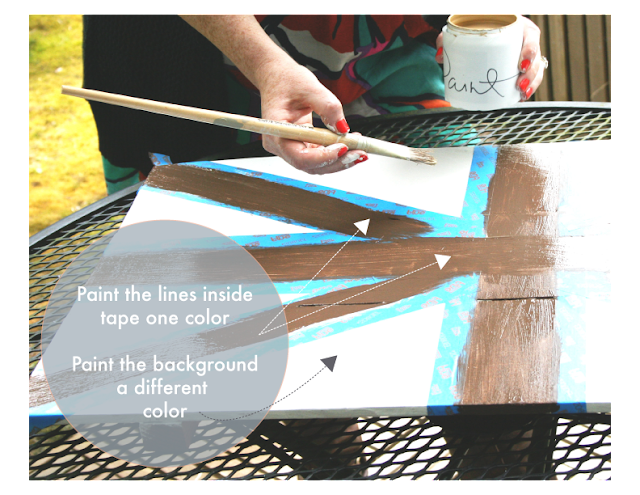 Place the ScotchBlue Painter's Tape where the white in the design will be. Leave open the spaces for the contrasting colors. Make sure you get the tape pressed down really well. A trick I often use is to use a spackling tool. Just go over your tape with one of those using a good amount of pressure - but not so much that you will scratch up your base coat! Paint inside the tape with two colos of your choice. As you can see it doesn't have to be in red and blue! You can do any color combination that floats your boat or works with your space! Tip: I bought "tester/samples" of paint. I even found some in an eggshell finish! This cost me about $3 for each as opposed to 15 and up for a quart or pint. My headboard was small but I still had over half of the paint samples left and I did two coats! Let it dry once again . . . Then just peel of the tape and you will see the extraodrinary fruits of your labor! I made this headboard for my sons room. It's small scale to fit his little bed but once he grows out of that it can later be used as a piece of wall art. 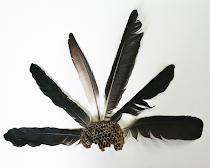 Or you can just make to use for wall art from the get-go! 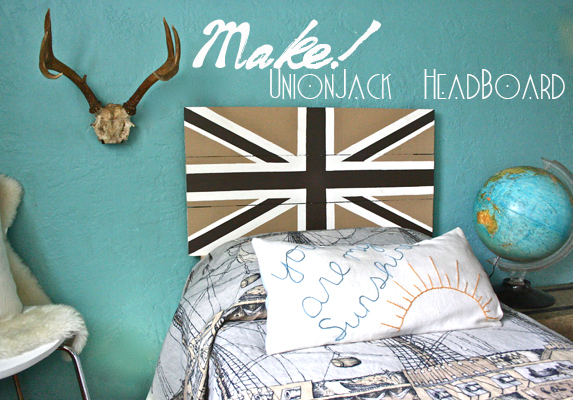 DIY Union Jack Headboard from The Plumed Nest on Vimeo. This post was created in collaboration with ScotchBlue Tape. 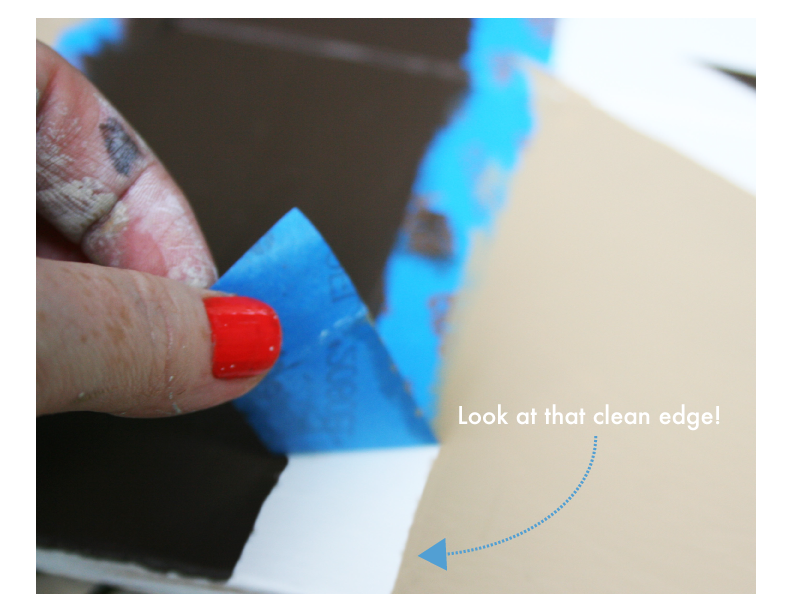 Do you have your own DIY projects using ScotchBlue Tape Painter's Tape that you would like to share? If so you can submit them ScotchBlue Ribbons on Facebook for chances to win cash and prizes! Great idea for a boys room. love it! That looks so mych simpler to make than I would have thought. Very cool! it also only cost me about $15.00 in total! Very creative - and looks super cool. Like something from a magazine! what a compliment! thank you!! Absolutely LOVE this idea for the headboard and what a fantastic tuntorial! Totally helps to have the video and see it! Thanks for the tip on the tape too! The last tape I tried didn't work at all. Will have to pick some of that up for my next project! This is a great project! I'm very into all things British right now with the Diamond Jubilee and the Olympics coming up! Hi there colleagues, nice article and pleasant arguments commented here, I am truly enjoying by these. Check out Webstagram to learn the top 100 hashtags and use them. impact on his trust of you, unless you anger him enough to make him leave. That's a good way to save money. However, apart from the savings, you can also get to express yourself with the headboard as well. I like that it can be used as wall art when it's no longer useful as a headboard. nice tip by home savings if you get bored of heardboard you could spruce it up little bit and use it as wall art.